Brethren in Christ constituents were in Washington on 11/20/15 to advocate for criminal justice reform. 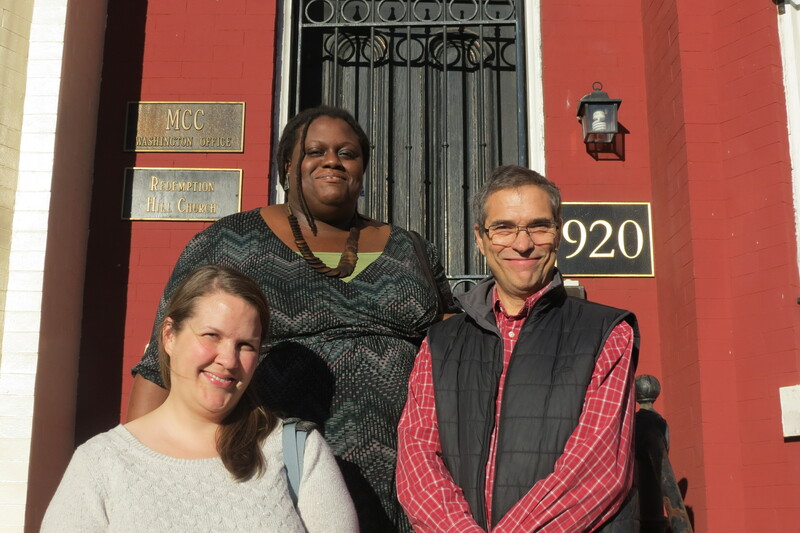 Last Friday the Washington office was privileged to have three constituents from Circle of Hope Brethren in Christ Church in Philadelphia, Pa. come visit us for the day. All three were deeply concerned with the many problems that mass incarceration has wrought on the U.S. today, and were advocating for changes to the criminal justice system. The United States currently incarcerates 2.2 million people, more than any other country in the world. Our criminal justice system imposes harsher penalties on people, particularly for drugs, than anywhere else. Decades of extreme policies have resulted in a booming prison population, overcrowding in prisons, and a system that disproportionately affects African-Americans and Latinos. While the main focus of the day was supporting the Sentencing Reform and Corrections Act (SRCA), we also sought to draw attention to problems that are not addressed in the bill. Of particular concern to our group were the struggles that many people face upon returning from prison. Jobs, public assistance, and education are all extremely difficult for people with a criminal record to obtain. If passed, the SRCA would not solve all of the problems that our criminal justice system has, even at the federal level. In fact, it would be no more than the first step in the right direction. But a first step is needed, even a small one. The three members of Circle of Hope Church understood this, and they generously gave their time to bring this bill and these topics to the attention of their representatives in Washington. More people are needed, however, if changes are to be made to a criminal justice system that is frequently far from just. If you are interested in advocating for criminal justice reform, let us know! You can contact your elected officials, meet in their local offices, or come to Washington in person to speak. It will take many more voices speaking out to correct the very unjust aspects of the criminal justice system in our country. Interested in materials on mass incarceration and racial disparities in the U.S. criminal justice system? Learn about The New Jim Crow project. Inquire today about getting your congregation involved! Learn more about criminal justice reform here, and sign up for action alerts for the latest updates from our office.